PandaTip: This order form template will allow you to offer package and a la carte photo prints to your clients. They’ll be able to choose the prints they want and sign the order form from any computer or smartphone. Use this order form to select the prints you’d like from your recent photography shoot. You can choose one of our photography packages or to order a la carte prints or files. Save money by purchasing one of our pre-configured photograph packages. Each package includes a variety of prints popular with most of our clients. If you’d prefer to assemble your own package using our a la carte print offering, you can select the prints you’d like using the pricing table at the bottom of this order form. PandaTip: Include as many packages as you like in this section by dragging new headers or text blocks from the menu to the right. The template is pre-built with 3 packages, but you can change it to include as little or as many as you like. Please make your photo print selections using the table below. You can select packages or individual items using the check-boxes on the left of the table, and can edit the quantity of each item you select. Your total package price will be automatically calculated and displayed at the bottom of the table. PandaTip: PandaDoc’s pricing tables are great for order forms. Once you’ve sent this template to your customer, they’ll be able to select the items and quantities they want to purchase. You can customize the table by clicking any line item or using the menu to the right. Once you’ve completed your print selection, sign this photo print order form below to indicate your acceptance of the pricing displayed at the bottom of the table above. 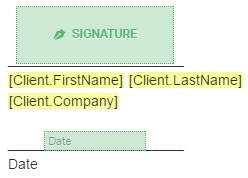 PandaTip: Your customers will be able to sign this template from any computer or mobile device. If you’d like to accept secure credit card payments right on your order form, simply integrate a free Stripe account with your PandaDoc account and drag the “Payment” block from the menu on the right.